U.S. Citizenship and Immigration Services (USCIS) announced it is redesigning the Permanent Resident Card (a.k.a Green Card) and the Employment Authorization Document (EAD) as part of the Next Generation Secure Identification Document Project. New cards will be issued beginning May 1, 2017. The purpose of the redesign is to incorporate security features and reduce tampering. USCIS notes that, “They are also part of an ongoing effort between USCIS, U.S. Customs and Border Protection, and U.S. Immigration and Customs Enforcement to enhance document security and deter counterfeiting and fraud.” Employers will need to educate themselves about the look of the new cards so as not to improperly deny employment to otherwise authorized individuals during the I-9 process. For now, both the new and existing versions of the Green Card and EAD are acceptable for FormI-9, Employment Eligibility Verification and E-Verify. Some older Green Cards do not have an expiration date. These older Green Cards without an expiration date also remain valid. 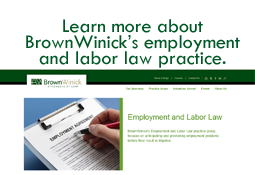 Have a look at this latest USCISNews Release to learn more or contact your BrownWinick Attorney.